Optimal navigation performance for trucks and transporters. 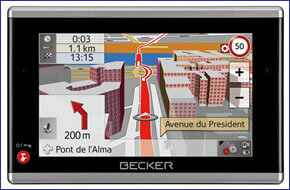 The new Becker Traffic Assist Pro Z302, the first Becker navigation system with truck-specific route guidance. The high-quality navigation system with remote control, Becker OneShot voice control, maps for 41 countries and special truck attributes allows you to define profiles that are tailored to your vehicle and load. Individual details on height, width, length, axle number, weight and payload can be saved which are then analysed in order to calculate the route. Impassable roads, tunnels and bridges are excluded depending on the profile data and possible, alternative routes are offered for selection in a map view so that you can choose the best route for you. Along the route, special Truck POIs are displayed to make the journey easier. Becker Traffic Assist Pro Z302 has been discontinued. With the new Becker Traffic Assist Pro Z302, Becker presents the first mobile truck navigation system, which the driver can use to define profiles that are tailored specifically to his vehicle and load. Individual details on height, width, length, axle number, weight and payload can be saved which are then analysed in order to calculate the route. Impassable roads, tunnels and bridges are excluded depending on the profile data and possible, alternative routes are offered for selection in map view so that the driver can choose the best route. For the first time, the scope of delivery also includes a 360° radio remote control that can be installed as required and used to control almost all of the Becker Traffic Assist Pro Z302 functions, offering the best possible operating convenience and optimum safety. A little extra, from us to you: The new Becker Traffic Assist Pro Z302 is supplied with Becker BestMaps included and thus guarantees the most up-to-date NAVTEQ maps for Europe for a period of 24 months – free of charge (conditions apply). Naturally, the Becker Traffic Assist Pro Z302 can also be used for other vehicles or by pedestrians and cyclists – simply select the correct profile and off you go. The Becker Traffic Assist Pro Z302 Bluetooth interface is designed for connecting Bluetooth-compatible mobile phones. Telephone numbers and addresses can be directly entered via the touch-screen display or selected from a list of contacts. Special truck attributes calculate a route corresponding to the profile input, taking into consideration relevant data, such as the vehicle dimensions, load, overall weight etc. Accordingly, the route that should/can be taken is the one displayed on the Becker Traffic Assist Pro Z302 4.3-inch display. Details such as bridge heights, blocks and truck-specific warning signs are incorporated in the analysis. The Becker Traffic Assist Pro Z302 includes a radio-controlled remote control which can be mounted as desired and allows you to use the Becker Traffic Assist Pro Z302 system easily and conveniently, without touching the touchscreen. It is particularly helpful and safe when the distance to the windscreen is large. The 3D navigation display has been further optimised. 3D terrain and city views as well as landmarks are displayed in high resolution and high detail. The end result is a more realistic route display and easier orientation. During your journey, the landscape you are driving through will be displayed in 3D. This provides prior notice of approaching ascents and descents or winding roads, allowing you to prepare for on-coming driving demands. The traffic warning signs, which are displayed according to their importance and relevance, enhance safety and offer a better overview of the anticipated driving situation, during the journey. The relevant traffic warning signs are shown on the display along the route. Free lifetime TMC is a traffic holdup warning service. Free lifetime TMC reports are compiled with current traffic flow data that are automatically recorded with sensors. The data are transmitted to a data centre, where they are analysed and relayed to the Becker Traffic Assist Pro Z302. *TMC: Dynamic route guidance with TMC Pro in Germany and Premium TMC in Ireland, France, Great Britain and Slovakia. Becker Traffic Assist Pro Z302 personal navigation device has been designed for plug and play, and as such can be transferred from vehicle to vehicle with ease by the user. The Becker Traffic Assist Pro Z302 is powered with a 12-24 volt adaptor cable in-vehicle (supplied) and using the Becker Traffic Assist Pro Z302 Active Holder and Windscreen Mounting Bracket can be used to secure the Becker Traffic Assist Pro Z302 directly to the windscreen or dashboard. The Becker Traffic Assist Pro Z302 utilises NAVTEQ maps for street-level mapping across 41 European countries. The Becker Traffic Assist Pro Z302 maps includes the following countries: Albania, Andorra, Austria, Belarus, Belgium, Bosnia and Herzegovina, Bulgaria, Croatia, Czech Republic, Denmark, Estonia, Finland, France, Germany, Great Britain, Greece, Hungary, Ireland, Italy, Latvia, Liechtenstein, Lithuania, Luxembourg, Macedonia, Moldavia, Monaco, Netherlands, Norway, Poland, Portugal, Romania, Russia, San Marino, Serbia and Montenegro, Slovakia, Slovenia, Spain, Sweden, Switzerland, Turkey, Ukraine, Vatican City.